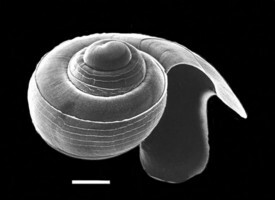 Atlanta plana is a moderately small species (maximal shell diameter = 4 mm). The shell is colorless except for the yellow-brown to red-brown keel base and violet spire sutures. The spire consists of 3-1/2 whorls and has a low, conical shape with rounded whorls and incised sutures. The spire bears two low spiral ridges on the second and third whorls. 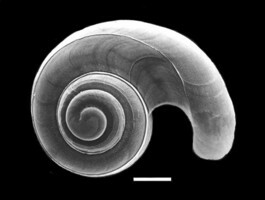 On the second half of the third whorl the spiral ridges are replaced by small punctae. The keel is moderately low with a rounded profile. Keel inserts between last two whorls in shells larger than about 3 mm. 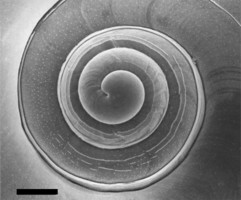 Eyes type b. Operculum type b., with a gyre that bears an outwardly-directed spiral row of narrow, low spines. 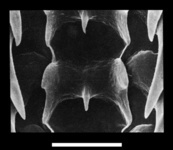 Radula type I, with unlimited numbers of tooth rows and no sexual dimorphism. Geographic distribution Indo-Pacific. Vertical distribution in Hawaiian waters mostly limited to the upper 150 m, with limited migration of individuals into the upper 45 m at night. 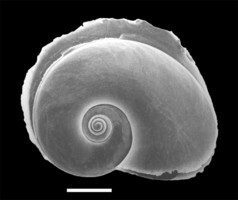 The shells of Atlanta plana and A. gaudichaudi are very similar in appearance (discussed by Richter, 1974 and Seapy, 1990a). 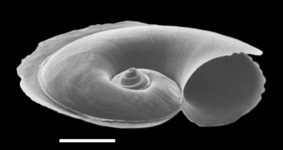 Both species are moderately small (maximal shell diameters of 3 and 4 mm, respectively) and have spires composed of about the same number of whorls (about 3-1/2). 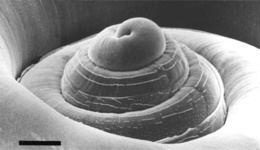 The spires in both species have a low conical shape with incised sutures. 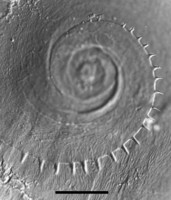 The shells differ most conspicuously in the presence and absence, respectively, of spiral sculpture on the second and third spire whorls. 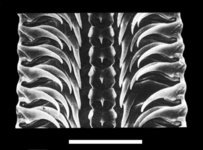 Their soft part morphologies also differ; the eye types are different (a and b, respectively), and the opercular gyres either possess (A. plana) or lack (A. gaudichaudi) spines. 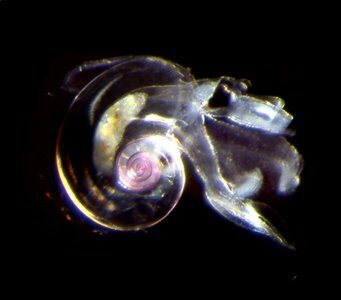 Atlanta plana can be an abundant species in Hawaiian waters (Seapy, 1990a,b and 2008), with the result that it is well suited for quantitative ecological studies. Diel patterns of vertical distribution of heteropods were examined based on replicated, opening-closing net samples (Seapy, 1990b). Atlanta plana ranged downward to 200 m during the day, although it was only abundant in waters shallower than 90 m. At night there was a pronounced upward migration from a 45-90 m depth interval into the upper 45 m. In a 2008 study based on duplicated opening-closing MOCNESS samples, the species ranged downward maximally to a 160-200 m depth interval at a station 5 nmi off the coast (comparable in location to the area sampled in the 1990b study). Similar to the earlier findings, densities were higher in the upper 40 m during the night than the day, although the differences were far less striking. Onshore-offshore comparisons of abundance patterns were markedly different between fall and spring sampling periods; maximal numbers were recorded at a station 5 nmi offshore in the fall, while in the spring abundances decreased shoreward by three-fold from a maximum at a 15 nmi station to a minimum at a 1 nmi station.